You’ll probably have lots of questions about how to get started. SCMA experts have written a Guide to Becoming a Childminder in partnership with the Care Inspectorate, to give you some of the answers. We’ll help you get everything you need to get your business off to a safe, sustainable start. Our Childminding Induction Support Programme costs £200 and SCMA has negotiated additional funding from the Scottish Government to support potential childminders access our Childminding Induction Support Programme. This funding covers the full £200 cost of the Childminding Induction Support Programme and you can access it by calling the Learn with SCMA team on 01786 445377 to book and begin your childminding journey with SCMA. On successful completion of the programme you will receive your first year of SCMA membership for FREE. The Childminding Induction Learning Course - available as either three interactive sessions or online via an easy-to-navigate e-Learning platform. A SCMA Strong Foundations Pack. Universal and tailored support from the team at SCMA. The opportunity to achieve an SCMA Accredited Open Badge. PLEASE NOTE: Skills Development Scotland (SDS) has re-opened applications for their Individual Training Account (ITA) funding from 15 April 2019. SCMA would encourage potential applicants to act quickly as funding is not guaranteed, and will be allocated on a first come, first served basis. Earn less than £22,000 per year and not be in full-time education. Be aged 18 or over and live permanently in Scotland. Graduates are eligible to apply for this funding. Can only be used on one single occasion within 12 month period. Are renewable each year, providing you meet the criteria and renew. 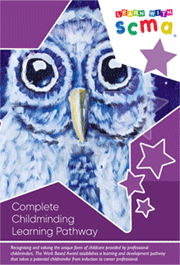 To book the Childminding Induction Support Programme, please give us a call on 01786 445377. The Care Inspectorate expect you to complete Childminding Induction Learning before you become fully registered as a childminder. SCMA has a proven track record in delivering Childminding Induction Learning. The unique role of the childminder, the role of the Care Inspectorate and requirements of the registration and inspection process. Knowledge on how to help children progress in their learning and development through the adoption of child-led participation, which is one of the core principles that every adult who deals with children and young people should adhere to. Getting it Right for Every Child (GIRFEC) practice guidance to enable childminders to adopt a child-centred approach. Meeting the needs of children, taking into consideration children's rights, wishes and making their voices heard. Positive behaviour management and marketing your service. Childminding is not easily visible to families looking for childcare, so the success of your new business can depend on your ability to market your service. Risk Assessment. The Care Inspectorate encourages early years services to "take a positive approach to risk, in order to achieve the best outcomes for children... supporting children to enjoy potentially hazardous activities, such as exploring nature and playing in the mud and rain". Health and Safety Considerations (Part 1). It is the responsibility of a childminder to ensure that their service and premises comply with health and safety and other relevant legislation. Health and Safety Considerations (Part 2). Our guidance will help you create a welcoming, low-risk, healthy childminding environment within your own home, and because of the importance of Health and Safety, it has been split into two modules. Running your Childminding Business. Childiminders must have a professional approach to operate their business, providing quality and complying with Scotland's new Health and Social Care Standards. We will discuss the business side of childminding covering everything from cash flow and expenses, to contracts and effective communications. Remember, the Childminding Induction Support Programme is designed to support you through every stage of the application process and beyond and includes universal and tailored support from the team at SCMA and the opportunity to achieve an SCMA Accredited Open Badge. Can’t attend a Childminding Induction Learning Course? Then remember there is an easy to navigate e-Learning platform. Call our Learn with SCMA team on 01786 445377 to find out more. 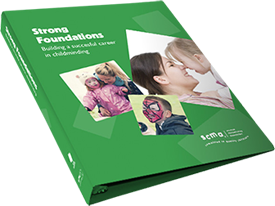 As part of your Childminding Induction Support Programme, you'll receive a Strong Foundations Pack, which will give you all the information you need to get started in your childminding career. Plus, once you have completed our Childminding Induction Support Programme you will receive your first year of membership with SCMA for FREE. A comprehensive step-by-step guide to Care Inspectorate registration process, developed for potential childminders in Scotland. Remember if you need any help we're only a phone call away. Our Helpline team can be reached on 01786 449063, Monday to Friday, 10am to 4pm. All the fundamental information about childminding and the early years sector, helping childminders of the future provide the best possible outcomes for their minded children. It will help you to build strong foundations for your professional growth and for sustaining a successful childminding service. As a childminder you are required to provide a safe and healthy environment for the children in your care. Our guidance to help you create a welcoming, low-risk, healthy childminding environment within your own home. As a childminder you will be self-employed and therefore required to keep business records. We will guide you through the business side of childminding covering everything from cash flow and expenses, to contracts and effective communications with parents. Developed to support you through every stage of the application process and beyond, our Strong Foundations Pack will be your best friend through registration and into your new career as a childminder. Childminding Induction Support Programme participants will be provided with a support system from SCMA – experts in childminding across Scotland. Our website (childminding.org) and our Helpline (01786 449063 Mon-Fri, 10am-4pm) are useful tools for potential childminders to access. Our experienced trainers are equipped to answer your questions, allay your concerns and initiate discussion. In addition, SCMA works closely with the Care Inspectorate and an Inspector is invited to attend the first session of the interactive Childminding Induction Learning Course. This is designed to make participants familiar with the role of the Care Inspectorate and the registration process. This also gives you a chance to pose your specific questions to the Inspector in person. All participants who complete the Childminding Induction Support Programme will be invited to apply for a SCMA Accredited Open Badge. Accredited Open Badges are digital certificates of accomplishment, skills and qualities that encompass formal and informal learning. The Learn with SCMA team will provide support and guidance when participants apply and complete an Open Badge application, helping you to achieve a virtual badge to evidence your learning. Membership of SCMA is £62 or FREE following completion of our Childminding Induction Support Programme. To be sure that you, your business, and the children you care for are covered you need insurance. Public Liability Insurance Cover with SCMA will cost £37.00 per year.